I’ve been out shooting, with the coolest, most distracting discovery of my photography interests. Sure, I started viewing the world in “ooh this would look nice if I set my shutter speed to 4 seconds” or “ooh if I did a F/2.6 on this one and focused on that…” when I got my Canon Powershot A520, but this discovery had me hankering over hot tungsten lightbulbs and sunny days, much longer than uh, my previous hankerings. But first, the cool stuff. Left: infrared, right: normal. Trees glow and reflect glorious IR from the sun. 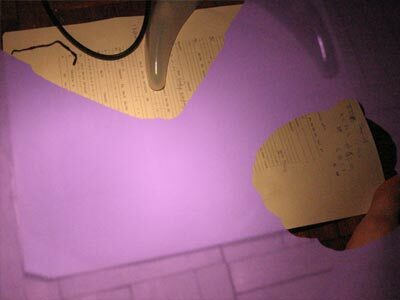 It can also see through certain types of ink, like this tabsheet, printed with a Canon bubblejet printer, and written on with a Kilometrico ballpoint pen. 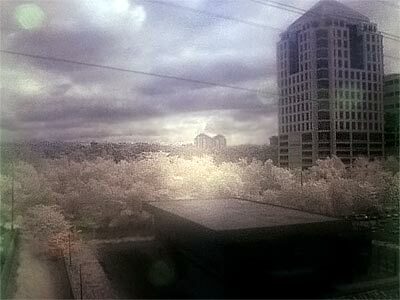 The infrared picture was superimposed on the normal one, and I erased away to show the with/without effects. Using flash, you can also place the filter on the flash and the lens for an ‘infrared’ flash! Combining pictures in Photoshop can be quite fun. This here, boys and girls, is the key ingredient. 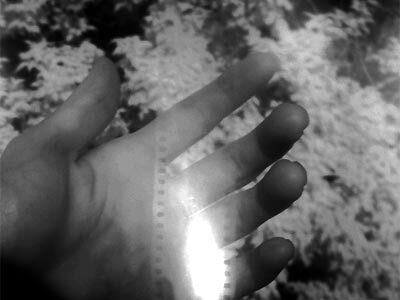 The blackened end of a 35mm film negative. 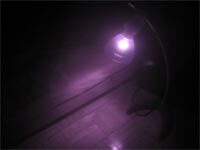 The purple part is more easily found, with the dark brown part being the more powerful filter. It filters out normal light, leaving infrared rays to pass through to your digital camera. Digicam CCDs can pick up a certain amount of IR (as compared to film cameras) but have a lens element which is coated to remove IR rays, otherwise giving a IR tint to normal pictures. Some digicams and webcams have a separate lens element just for IR filtering, even! The amount of IR that passes through depends on the digicam. 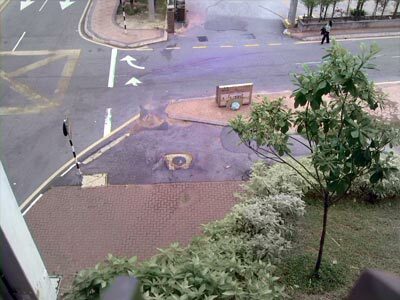 The spots on the purple part were caused by rainwater. While it could not wash off the layer, it did leave temporary blemishes. 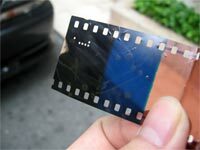 You could however use fingernails to scratch off any of the parts to find the original transparent, colorless cellulose film. In case you’re wondering, I found the film in my mom’s 20-year old stash of negatives. You may not find such amateurish film processing (the machines will replace them all!) and may end up with a smaller purple portion. 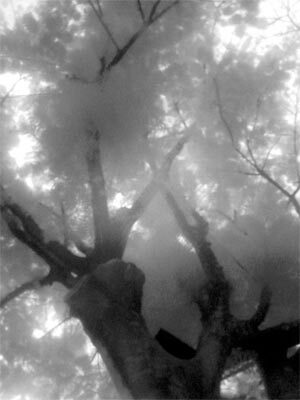 Film negatives become transparent in infrared! Left: One layer of film negative; right: two layers. I usually stack four (that makes it really dark) so I’d have to compensate by slowing the shutter speed about 250 times, or making the aperture larger (to say F/2.6). The more layers, the less natural light and color shows. The best time to get glowing trees is in the bright sun, when you set your camera to Program mode, and it tells you the shutter speed should be 1/250 or faster. Both pictures are unedited! Fazri‘s Canon Powershot A95 was less sensitive to infrared radiation but had sharper, much more focused pictures than mine! Here, he uses his swivel screen to prop his camera at an angle. He also folded the negative strip so it would provide four layers of filters, then used a wire to fasten the layers. The second picture, if you noticed, had green globs; that was the sun’s effect. There is also a slight white spot in the middle, caused by: 1) negative layers being slightly curved and not flat 2) zooming in 3) having an aperture that is too small (F/7.1 or so). To focus, first focus on the subject without the negative, then place the negatives, and if possible, make your focus slightly shorter. If you’re lazy you could just set it to infinity like I do. Now for some math: If you were in the sun, taking a picture of a field, and the camera says it wants to use a shutter speed of 1/1000, you may have to slow it down to 1/4. 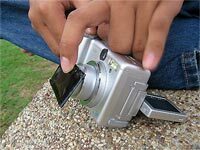 Your digicam would obviously show you white, but heck – press the focus, and while your digicam does its automatic focusing, you would see a darkened picture (for a split second). How do you make a dark brown/purple negative anyway? Just pull out an unused film roll and leave it in light for 5 seconds to overexpose it. Send it for processing only. (Unless you like staring at completely white photos.) Total cost? 10% of a proper, commercial IR filter. This entry was posted in Geek, Pictures on October 19, 2005 by 2konbla. 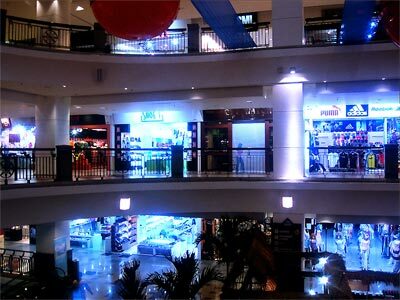 i forgot to add: i may have to use a few negatives to fill the dimension of my slr lense, cause tak muat. you can use a 120mm film roll, dave. That should be able to occupy most slr lenses.